Well, that title is a stretch of the truth, as I've had these headphones a few weeks now, but that at least gives me a fair shot at giving some feedback on the quality after having used them for a little while. So, a few weeks ago I got the buying bug again, and there were a couple of models of headphones that were on my radar for various reasons. 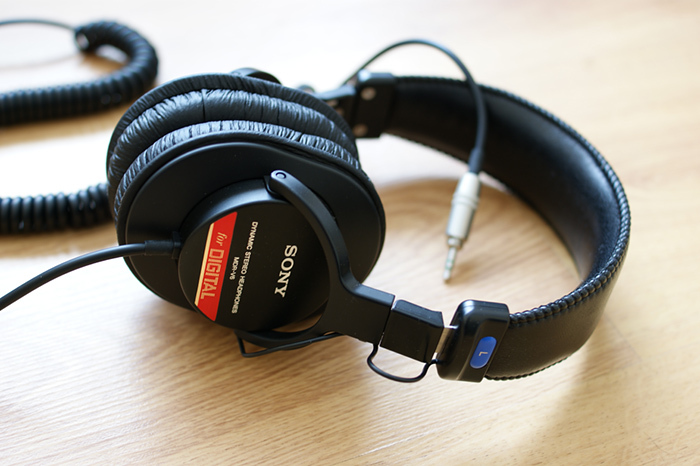 The Sony MDR-V6, a model of headphone that has been in production since 1985, is widely used in studios and possibly one of the best value for money headphones on the market; and the Panasonic RP-HTX7, which after following the introduction for the V6, are nothing special - just some retro style headphones that have been the subject of product placement in a couple of shows I watch (I'm a bit of a collector/hoarder, so I couldn't resist buying them). The MDR-V6 were of particular interest, because of how many photos I've seen of voice actors, singers and inside studios that have these headphones, or one of the many variants. I thought for something to be so widely used, they must be pretty good. I didn't really have high expectations for the Panasonic since they were the cheapest headphones I own (£37), so not really fair to compare them to the K701 that cost 5x as much. That said, as my collection grows, it means I have more points of reference/comparison, as well as a clear high (AKG K701) and low (Panasonic RP-HTX7) anchor. As I mentioned earlier, the Sony V6 released in 1985. It's amazing that a product has lasted that long and is still in production, as most things are cycled out after a few years, such as models of cars (I wish to buy a brand new Mk2 SW20 MR2 ;_;), games consoles, audio gear, computers - the list is endless. That's not to say that Sony haven't attempted to improve and revamp them over the years, often at a higher price tag. I went with the V6 after much deliberation, as I was torn between those and the 7506. The general comments I seemed to come across was that the 7506 were a bit more detailed; suited more for monitoring, and that the V6 were more fun/enjoyable. I liked the idea of having another pair of detailed headphones, and the 7506 have a gold plated connector over the V6, but Sony claim the frequency response of the 7506 isn't as wide (to be honest, 10-20,000Hz seems like some safe cop out rating you would give something without even testing since it's so much narrower than all the other models). The thing that finally swung it for me was my original reason for buying them - trying to find the best quality/neutral headphones for the lowest price. Good quality audio is something everyone should be able to enjoy, but not everyone is comfortable with spending £200 on headphones and a load more on amps and DACs. As it turns out, the V6 frequency response is a little closer to the K701 than the 7506 are. No real complaints here. They feel reasonable quality for their price and the cable/jack is very well made. The ear pads aren't real leather, and I've read that they peel/flake after some time, which is something that happened to an older pair of Sony V700 that I had. Fortunately you can buy replacement pads, so it's not a deal breaker. The 6.3mm adapter is threaded and screws on to the 3.5mm jack very securely. Once the 6.3mm connector is screwed on, it looks as though it's just a single 6.3mm jack rather than an adapter. A special mention goes to the presentation of the packaging, which is some of the classiest I've seen for headphones of this price range - this is something you wouldn't mind giving as a birthday present for example. Overall they are pretty comfortable. They are a snug fit and feel as if they won't go anywhere if I'm moving around, so possibly quite good for outdoor use, if you are the kind of guy to wear fullsize headphones outdoors (fistbump if you are). The headband has numbered click stops, so you can set the correct size for your head and it will stay there, particularly useful if you have people who like to "borrow" your gear as you can just click them down to the number that's right for you instead of messing around trying to get comfortable again. The ear pads are a good size. Not quite as spacious over the ear like the K701, but large enough to surround your ears. In my case I can feel my ears pressing on the inside of the cups a little which is something that doesn't happen with the AKG. It's not particularly a bad point though, just an observation. I don't feel as though this ruins the comfort of them. The inside of the cups/driver cover is nicely padded with good quality cloth. The overall tone is pretty well balanced, the bass is good, giving kick drums a real kick to them and the treble isn't harsh at high volumes like it can be with some headphones. Some might say they enhance the bass a bit, but I find them pretty well balanced for the price. I would say they are mostly neutral, perhaps with a slight emphasis on the bass, but that might be just me being used to the lesser bass of the open back K701. They are fairly detailed, but could sound better if they had a tiny bit more treble, but getting that balance right is tricky without sounding dull or too bright. The sound stage is average - they don't sound artificially wide, nor do they sound flat or lifeless, but it would have been nice if it was a little wider I guess. They sound reasonably good on standard audio out jacks like those found on laptops, audio players or phones, but they are rated at 63 ohms impendance, which means that to get the higher volume levels, you could do with an amplifier. They sound better on an amp, but I don't think they benefit as much from it as other headphones. It's amazing how similar these sound given the huge price difference. The Sony MDR-V6 punches well above it's weight, giving an overall similar tone to the K701, however I feel as if the V6 has a little more bass and mid-bass, but a bit less treble than the K701, giving the V6 a slightly less detailed feel at the side of the K701. That's not necessarily a bad thing though as a lot of people comment on the K701 sounding a little bright and/or lacking bass - so take that as you will. The K701 certainly sounds a bit cleaner on most metal/rock songs, mostly owing to the fact that I feel the mid-bass on the V6 is a little on the "slightly too much" side. The K701 also won out in terms of realism, most likely owing to the advantages of an open back setup. They are power hungry, meaning that I was having to turn my amp up to similar levels with either headphone connected, so if you like your music loud, you might want to invest in a small cheap amp. It's not really fair to compare the design of the V6 to the K701, as the K701 are beautiful, yet the V6 have their own down to earth charm. The K701 build quality is of course better given the price tag, but the K701 still manage to feel delicate. At least with the V6 I feel they would withstand knocks a bit better, and if they did break they don't cost too much to replace. The K701 beats the V6 on comfort hands down, but the V6 aren't what you would call uncomfortable, although the ear pads can get a bit hot and stuffy after a while. Nothing comes close to the comfort of the K701 - you just can't beat that combination of cloth ear pad and open back. Although the V6 are designed to be neutral, and the XB700 are designed to enhance bass, I thought it would be interesting to make the comparison anyway since they are in the same price bracket. Are they really in the same price bracket? Ok, so I know they serve different purposes, but the V6 sound like they should cost twice as much as the XB700. Of course the V6 is down on bass at the side of the XB700, but if I'm honest it's not so much that I would choose the XB700, not when the treble, detail and overall balance of the V6 is so much better. I know it's not fair to spout words like detail, balance and neutral when talking about some bass enhancing headphones, but the sound of the XB700 is really weird. There is very little top end at all, and in some songs, I was missing out on details I could hear fine with all my other headphones. Sonically, the XB700 are weak. They aren't just a normal pair of headphones that have been tuned for bass; whatever happened during the process totally killed the top end making everything sound dull in comparion (but maybe that was intentional so you can turn the volume up and rock the bass without going treble deaf). I find the XB700 are more comfortable, and with the design and those huge ear pads, they do feel quite premium at the side of the ancient (read: almost as old as me) V6; with the added bonus of it not having a sticker on the side stating FOR DIGITAL. The build quality between both models is decent, but I feel the V6 cable and connector is way better quality, and will most likely last longer. Also the V6 is single side entry, where the XB700 use the annoying double entry cable. Over all, these are fairly neutral headphones, snug fitting and relatively comfortable (perhaps not for extended periods though). For sound quality, I really feel that you are getting a good deal for your money and won't hesitate to recommend them to anyone who asks for good headphones in the £50 range. They aren't quite detailed enough to be considered analytical, but they don't miss much. Of course they aren't for everybody and the dated design might be a turn off for your Beats by Dre wearing friends acquaintances. It wasn't until I started writing my review of the Sony MDR-V6 that I realised I hadn't reviewed my Sony XB700, so I thought to give some background (as I reference them in "future" reviews) I would go back and review them. 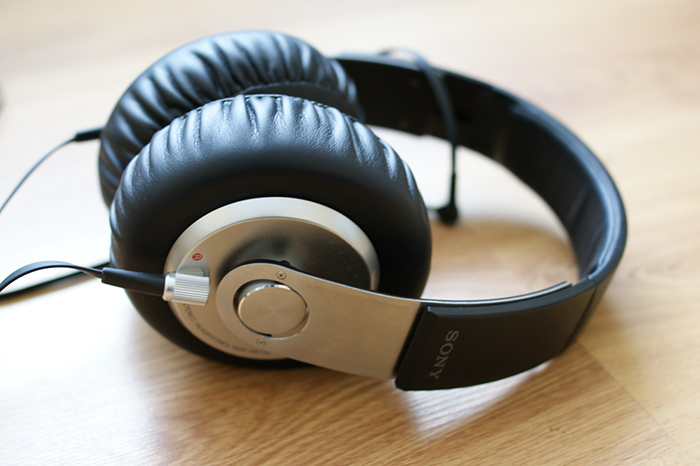 The Sony XB700 are part of Sony's extra bass style headphones, and come in various tiers of shapes, sizes and cost. Starting off at the low end there are the XB300 right through to XB500, XB700 and XB1000 (XB700 were the old "flagship" XB series, now replaced with the XB1000). The XB500 seem a little redundant since the XB300 takes care of the low end/low cost/portable market, the XB700 works nicely as home headphones and the XB1000 notable for their 70mm drivers. The XB500 are just too close in price, size and style to the XB700 for me to understand why anyone would go with the XB500. As you will have no doubt figured out already, these are coloured headphones (meaning not neutral). That is they won't present music as it was recorded or intended to sound, but will boost certain frequencies, changing the tone of the music. What this means is that they will most likely suit certain styles of music better than others, which makes them a bit specialist, unlike a neutral pair of headphones which should sound good with anything. But that's fine if you already have a decent pair of neutral headphones. I bought the Sony XB700 because I thought they would compliment the K701 - have one pair of neutral, open back headphones, and have some cheaper bass tuned headphones to compensate for the tracks where the bass on the K701 isn't as strong as I'd like. Specs wise, Sony claim they cover 3-28,000 Hz, handle up to 3W (yes, that's 3000mw...) and are rated at 24ohms impendance which is good news for portable players as they are easy to drive. The build quality is really nice. They feel stable and have some very soft, premium feeling leather pads - you really need to feel these if you ever get the chance. The headband is a mix of plastic/leather for the upper part, and brushed aluminium for the parts near the ear cups. The ear cups continue the metal theme, but are unfortunately just silver coloured plastic. The headphone cable is fair quality, but on my external amp I can hear some interference which is the same level no matter the volume. If I use the built in amp of my DAC, it goes away, so I would guess that where Sony decided to go with a flat cable design, it means they had to skimp on shielding, and this is why it's picking up the interference. It's odd, because I don't get this issue on any of my other headphones, or even sensitive IEMs. The design is a cross between sleek and over the top. The headband is clean and smooth, with some brushed aluminium detail at the bottom, and the earpads are incredibly soft and equally large. The ear pads are large enough to completely cover your ears and they don't seem to get quite as hot or uncomfortable as they do with most leather ear pieces. The headband has a small amount of padding, but it's very soft and does the job perfectly. The headband has click stops, so they don't go anywhere once you've set them to a comfortable size. The inside of the cups are just covered with cloth and aren't padded, which doesn't seem to present a problem for me, but if you resemble Gary Lineker it might irritate you. The headphone cable is dual entry, which gets annoying at times, and there is only 1.2M of it, which is fine for portable use, but can be a bit short when using at home when you are tied to your desk amp, computer or whatever. They do a good job of boosting the bass, but the width of bass frequencies they boost is a little too wide for my liking. Ideally, I would like most bass enhancements to taper off at around 80-100Hz which is around the same kind of setting you would have for a subwoofer. At these frequencies, you can boost bass without having much effect on the tone of the rest of the music (a classic example is listening to a radio with male voices coming through the subwoofer occasionally - horrible). Unfortunately, cutting the bass at around 200-250Hz gives a bit of a muddy sound. At the other end of the scale, the treble seems a little lacking in places which is weird because it's not an overall dull sound, it's what I can only describe as "peaky", as if someone took an EQ and put say 6Khz in positive boost, then the next band in negative, then the next in positive etc. This slight dullness to the treble may even be intentional on Sony's part, as it means you can ramp up the volume and let the bass rumble without going treble deaf. It's hard to compare the XB700 to anything I own currently, as I tend to go for neutral sounding headphones, but for the sake of completeness, I will draw some comparisons. Unsurprisingly, you can hear the difference in the price of these headphones, as the K701 cost three or four times as much. The K701 has a much wider soundstage, even though I wouldn't say that the XB700 was unusually narrow - it's just the case that the K701 have a wide soundstage and many people comment on this and sometimes say it sounds a little artificial. The different instruments and frequencies are all clearly distinguishable with the K701, whereas the XB700 sounds rather busy, crowded and muddy in the low end, no doubt due to the range of boost they applied. I still say if they had boosted the bass only up to ~80Hz, it would have greatly improved the overall clarity. The K701 and XB700 are pretty much opposites at the high frequency end with the XB700 sounding a little dull and peaky, and the K701 sounding bright and pinpoint. The difference is that you will be able to listen to the XB700 at much higher volumes without piercing your ear drums than the K701. The top and bottom of this treble thing, is that the K701 has a clarity and tone to it that makes me want to get my air guitar out, and the XB700 makes me want to get my equalizer out. The XB700 sound pretty much the same they do on low powered devices as they do a dedicated desktop amp, and they are easy enough to drive for you not to require an amp to reach high volume levels. The K701 wins out on comfort, but that said it's hard to beat the combination of cloth, full size ear pads and open back design. Closed back, leather pads can't really compete. I can wear both for any number of hours, but the K701 are at a level where you can't really feel anything, but with the XB700 you are always aware that you are wearing them. A bit of a fairer comparison, but even so, at release the V700 cost almost twice as much as the XB700, and sound pretty similar to the K701 and V6 so much of the same comments apply here. The V700 has a wider soundstage than the XB700, but not as wide as the K701. The general feeling when going from XB700 to V700 is that it sounds clearer and more detailed. As expected, the XB700 beats the so called DJ headphones on bass, as the V700 are on a similar level in terms of bass to the K701 (frequency response grahps suggest maybe a bit less). In terms of design and build quality, the XB700 are better as they don't suffer from those crappy swivel joints that always used to break, and the plastics don't feel quite as cheap. The XB700 also beat out the V700 in terms of comfort by a long shot as the ear pads on the V700 are only thin, so it means your ears are pressing against the driver housing which is poor design in my books. To be blunt, I was a dissapointed with the sound quality. I was expecing a pair of good headphones with a smiley face style EQ - that is increased bass and increased treble, but in the end what I ended up with were some headphones that have good bass but weird dull/peaky treble. I'm not sure where it went wrong. I mean I don't think it's asking much for Sony to take the MDR-V6, put some fat ear cusions on them, update the style a bit and give them a nice big bass boost and taper it off at 100Hz. Maybe it's a driver issue, or maybe it's a housing design issue, who knows. Reasonable headphones if you can get them for £50 or less and certainly not the worst I've heard. Some criticism of the tone, but be warned that the headphones I was comparing them too were all high end or noteworthy for a reason. A good alternative to Beats Solo. I tried these on in HMV some time ago, and while I wasn't able to draw direct comparisons at the time, I was surprised at how similar the tone was, yet the Sony were 1/3 of the price.